Remarkable Marketable Me: This is special. There's a film coming out about Kindra, The inspiration for Human Tribe Project. This is special. There's a film coming out about Kindra, The inspiration for Human Tribe Project. "Kindred" Movie Trailer from Michael Sternoff on Vimeo. Click on the link above to see the human tribe project main page! Human Tribe Project is dedicated to the memory of Kindra Marie McLennan. Kindra passed away on January 2, 2009, after an eight-month battle with a rare and aggressive form of cancer. She ultimately lost the fight, but her struggle inspired this company and the idea that we are all members of individual tribes that unify to support a loved one in a time of crisis and that together – bound by the humanitarian spirit – we are all part of a larger Human tribe. After being diagnosed in April 2008, Kindra chronicled her cancer journey through a blog, now available for public view at www.kindramclennan.com. She wrote with humor, describing all aspects of her experience including her initial scan, chemotherapy, radiation, surgery and side effects, with hope and laughter. She initially wrote to keep her friends and family informed, but in the end, her blog acted as an inspiration to everyone who read it and served as a vehicle to give and receive support during her time of crisis. Her blog touched all who read it, and was even the subject of a front-page article in the Chicago Tribune, available here and a television news story, available here. During her treatment, Kindra’s friends came together to raise money to help Kindra and her husband with her ever-increasing medical bills. Kindra refused to take handouts from her loved ones, so her friends sold handmade necklaces in her honor and gave all proceeds to Kindra. Not only were her friends and family able to raise approximately $10,000, but Kindra could see their love and support in every necklace that was worn. She once commented how meaningful it was for her to see her chemo nurses wearing her necklaces in the cancer center. Kindra was one of the most inspiring, loving and kindhearted people to ever walk this earth. She had an infectious smile and a joy for life. She could find the positive in any situation and had a way of making everyone she encountered feel like he or she was the most important person on earth. She was a wife, a daughter, a sister, a therapist and the best friend you could ever imagine. Kindra passed away shortly after celebrating her 30th birthday with friends and family in Las Vegas, Nevada. Her life was cut short, but the positive effect she had on those of us that remain is everlasting. Commenting on Kindra’s blog posts, her friends have said the following: “If ever a person lived life to its fullest and tasted all of its joys, it is you. You bring warmth and laughter to each person you meet.” “Not a dark cloud, always sunshine when people are around you, Kindra.” “You will always represent sunshine, love and all that is good in the world.” “How lucky are we to know you...your positive attitude, infectious sense of fun and loving spirit are truly one of a kind.” “We are all better people for having had you in our lives.”“Your inner and outer beauty shines and has ever since the first day I met you.” “Thank you for coming into our lives and sharing your warmth, compassion, laughter, and genuine friendship with us. You have always reminded us what it means to truly live life to its fullest.” It is our hope to continue Kindra’s legacy through this website and enable tribes everywhere to quickly and easily support a loved one in a time of crisis. We are all connected; we are all members of the Human tribe. Human Tribe Project is a free website that allows friends and family to come together, show support and raise money for a loved one during a health crisis. It was founded upon the premise that all people belong to a larger Tribe comprised of their loved ones and acquaintances, and that this Tribe can be a powerful resource when one of its members is in need. Human Tribe Project was initially created to help cancer patients bridge the gap between insurance coverage and real costs, and to provide emotional support along the way. According to a report released by the Kaiser Family Foundation and the American Cancer Society, private health insurance doesn’t protect cancer patients from high costs. Despite having insurance, many cancer patients incur large debts, in some cases causing them to file for personal bankruptcy, and even delay or forgo treatment simply because they can't afford care. In addition, research shows that recovery from cancer is significantly better if a patient receives emotional support during treatment. The need for emotional support and relief from a financial burden is not confined to cancer. Human Tribe Project can be used to help any person in crisis, whether that crisis is the result of a medical diagnoses, premature birth, natural disaster or personal hardship. Whatever the cause, Human Tribe Project can facilitate the support. Human Tribe Project is not a non-profit organization, and differs from many fundraising institutions. Instead of directing money toward research or through a large non-profit requiring extensive administrative and operational costs, Human Tribe Project gives money directly to individuals in need, at the time of their need. Unlike most other organizations, one hundred percent of the money gifted through Human Tribe Project goes directly to the individuals in need. Human Tribe Project enables people to unite as Tribes and mobilize support quickly and easily through this website the instant that a loved one notifies them of a crisis. A Tribe Leader sets up a Tribe Page, on behalf of the Beneficiary, and includes the Beneficiary’s story and an explanation of why funds need to be raised. The Tribe Leader then unites friends and family by entering in their email addresses, thereby inviting them to join the Tribe. Tribe Pages are used to keep the Beneficiaries and their Tribes connected. Each Tribe Page contains a blog, a guestbook, moveable web badges and an option to invite others to join the Tribe. Most importantly, Tribe Pages contain the Tribe Tag Store where Tribe Tags can be purchased to financially support the Beneficiary. Each Tribe Page has both semi-public and private portions. The Beneficiary’s blog, guestbook and all posts are private and only viewable by invited Tribe Members. The Beneficiary’s picture and story and the Tribe Tag Store for each Beneficiary are public and viewable only when a person searches the Beneficiary’s name. Allowing these portions to be semi-public maximizes the number of Tribe Tags that can be purchased and thus maximizes the amount of support a Beneficiary can receive. For more specific information about how Human Tribe Project works, please visit our FAQs. Tribe Tags are the foundation of Human Tribe Project because they offer both the emotional and financial support necessary to help a loved one through a time of crisis. They facilitate financial support in the form of Monetary Gifts, and emotional support by acting as a visible reminder of the constant encouragement and support the Tribe offers the Beneficiary. They unite the Tribe around the Beneficiary and exemplify how the humanitarian spirit connects us all. The Tribe Tag design is inspired by a traditional dog tag, which is emblematic of a group coming together to overcome a struggle and an iconic form of identifying one individual in a group of many. Tribe Tags include three charms: a Human Tribe Project tag, a Tribe Print charm symbolizing the common thread that connects us all, and a personalized charm bearing the initial of the Beneficiary in whose support it was purchased. 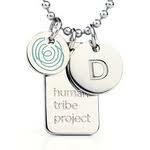 Tribe Tags are steel charms strung on a ball chain. They can be worn as a sixteen inch or eighteen and a half inch necklace or carried on a two and a half inch key chain. Tribe Tags are sold in the Tribe Tag Store on each individual Tribe Page. Nickel Plated Steel Tribe Tags sell for $20, $15 of which is given directly to the Beneficiary as a tax-free Monetary Gift from the purchaser. Sterling Silver Tribe Tags sell for $100, $75 of which is given directly to the Beneficiary as a tax-free Monetary Gift from the purchaser. Monetary Gifts are paid out monthly, based on the number of Tribe Tags sold that month. One hundred percent of the Monetary Gifts, without any amount deducted for operations or processing, are given to the Beneficiary. For more information about the Monetary Gifts, please visit the Monetary Gift Policy. To purchase a Tribe Tag in support of your Beneficiary, Find or Create a Tribe now. Jaclyn is the managing member and general counsel for Human Tribe Project. 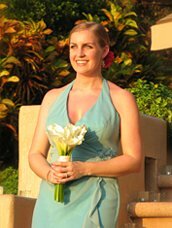 Before leaving corporate America to pursue her passion with Human Tribe Project, Jaclyn worked at the law firm of Gallagher & Kennedy, PA, the United States Senate, the Arizona Supreme Court and Gap, Inc. She received her J.D. from the College of Law at Arizona State University and her B.S.B.A. from the University of Arizona. Jaclyn and Ryan live among family and friends in Phoenix, Arizona. Jaclyn is an active volunteer with Big Brothers Big Sisters and has worked locally with Crisis Nursery and the Children’s Law Center. Her goal is to create a legacy for her dear friend Kindra McLennan by facilitating fundraising efforts for friends and families in crisis. Ryan conceived the concept for Human Tribe Project and handles long-range planning and management. Ryan founded Sterling Turquoise, Ltd., an international wholesale jewelry business, which he has successfully managed for the past seven years. He has a B.A. degree in English from University of Arizona. Ryan is a native of Phoenix, Arizona. He and Jaclyn met in college but waited ten years to reconnect and get married. He is an active volunteer with Big Brothers Big Sisters. Matt is the marketing manager for Human Tribe Project. Before joining the Human Tribe Project team, he managed a corporate team in the United States and abroad for Case Logic, Inc. Matt has owned a stake in Sterling Turquoise, Ltd. since its founding, and has been acting as the marketing manager for the past six years. He has a B.S. degree in Public Relations from Northern Arizona University. Matt and his wife have two children and live in Phoenix, Arizona. Steve is Human Tribe Project’s design guru. Steve worked for a Fortune 500 company for five years and is an owner and manager of Sterling Turquoise, Ltd. He attended Northern Arizona University and has a degree in Fire Science. Steve and Ryan have been close friends since high school where they met in Freshman English class. Steve and his wife are grammar school sweethearts and live with their three children in Phoenix, Arizona. Human Tribe Project is a closely held company owned by the above founders and several friends and family members. All are very important to Jaclyn, Ryan, Matt and Steve and all are dedicated to the concept and benefit of Human Tribe Project. Learn more about the Tribe Tag.